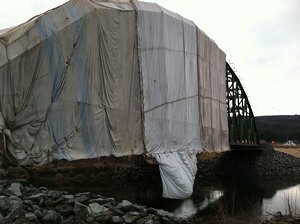 WTF: What's up with Richmond's sheet-enshrouded bridge and the Beltline's white foam blocks? High-speed travel around Vermont generates more WTF questions than all other activities combined. That’s not surprising, given that racing by highway infrastructure projects at 65 miles per hour affords drivers little opportunity for close inspection and plenty of time for speculation later on. Such is the case with the Checkered House Bridge on Route 2 in Richmond. For months, the 350-foot metal truss bridge, the longest span of its kind in Vermont, has been partially draped in billowy, parachute-like material. Whatever is happening beneath the beige and white curtains is concealed from travelers who cross the bridge, as well as those who drive past on nearby Interstate 89. Are the drapes a new window treatment for downtown Richmond? Vermont’s answer to Seinfeld’s puffy shirt? Or a covered-bridge installation by Christo, the avant-garde artist famous for wrapping Berlin’s Reichstag, among other structures, in fabric? The answer is nothing remotely that artsy, though it does involve painting. Three coats, to be exact, according to Carolyn Carlson, a structures design project manager with the Vermont Agency of Transportation. Over a two-day period in mid-June, the Checkered House Bridge — so named for the distinctive checkerboard brick pattern on the nearby farmhouse that’s now the Kitchen Table Bistro — was cut in half and widened by 12.5 feet so larger vehicles could traverse it. The $15.9 million project, more than 20 years in the making, is believed to be the first one to widen a truss bridge in this way, Carlson says. Now that the trusses have been welded back together and a new bridge deck installed, the entire structure needs repainting. Fair enough. But why does the historic bridge, which was built in 1929 to replace an earlier one damaged in the great flood of 1927, need to be enveloped in sheets? As Carlson explains, workers must first remove several coats of decades-old lead paint that still covers the steel beams. Lead paint, which is especially hazardous to small children, was outlawed in 1978. Under a Vermont law adopted in 1996 and revised in 2008, workers must protect the public and the environment from exposure to lead dust. Behind the billowy curtains, massive heaters keep the temp a balmy 80 degrees, Carlson explains, allowing painters to continue working in the winter. She notes, however, that once the first half of the bridge is completed, the second half will be wrapped in considerably smaller increments, owing to concerns about falling snow caving in the drapes. The finished half of the bridge, which has just been painted green, is due to be unwrapped in the next week or two — just in time for the holidays. A smaller but equally puzzling project has been in the works along Route 127 in Burlington, just north of the Ethan Allen Homestead. For the past few weeks, the east side of the Beltline has been lined with hundreds of large, white foam blocks, each the size of a minivan. Recently, excavators and road crews have been moving the blocks onto the nearby bike path, which is below road level. What gives? 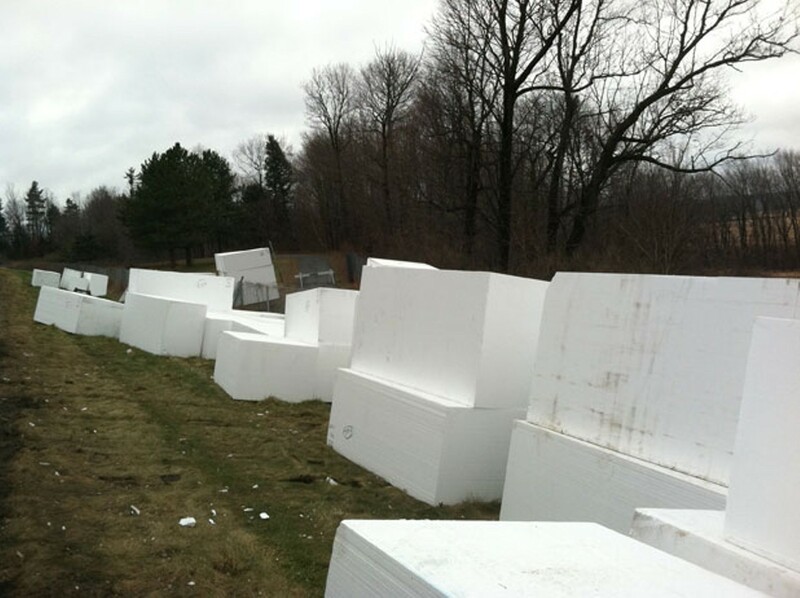 Steve Goodkind, Burlington’s public works director, refers to the objects by a highly technical-sounding name: “big foam blocks.” Made from a type of polystyrene, the blocks are being used to shore up 300 linear feet of eroded bike path and embankment abutting the Winooski River, which, according to Goodkind, has collapsed and been repaired numerous times since the Beltline was first constructed in the early 1980s. “It’s been failing from the get-go,” he says. “This was our last, best hope” of saving the bike path from permanently sliding into the river. On a recent weekday morning, site engineer Widge Currier, of the firm Engineering Ventures, explains how the underground stabilization system works. Cheaper and more lightweight than sand, soil, gravel and other fill materials, the 8-by-4-by-4-foot geoform blocks, each of which weighs just 230 pounds, provide a solid structure on which the bike path will rest. Once they’re assembled in place like bricks, the entire structure will be covered in plastic, buried in dirt, and then repaved come spring. The blocks, which have been used for years in the southern United States for bridge abutments, road beds, embankments and retaining walls, were only recently discovered by northern road crews, Currier says. This isn’t the first time they’ve been used in Vermont; Currier says a few blocks aided in post-Irene reconstruction projects. The very property that makes environmentalists revile Styrofoam clamshells is what renders these geoform blocks ideal for reconstruction work: They don’t biodegrade in the elements. Should Vermonters expect to see more of the big white dominoes cluttering the roadsides? Maybe, maybe not. Shelter Enterprises of Cohoes, N.Y., manufactured the blocks. According to the Albany Times Union, the Cohoes plant was destroyed in a fire in September, forcing all 40 employees out of work.